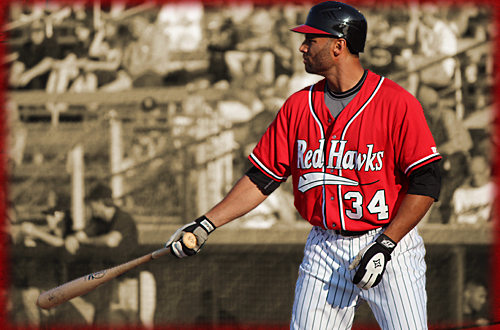 The 2012 American Association Player of the Year is coming back to Fargo this summer, as the Fargo-Moorhead RedHawks have re-signed CF Nic Jackson. Jackson, 33, hit .309 with 31 doubles, two triples, 17 home runs, 89 RBIs and 77 runs scored in 99 games. He has stolen 19 bases and committed just two errors in 234 total chances in 95 games in centerfield while leading the RedHawks to a league-best 65-35 record and a North Division Championship. Jackson led the American Association RBIs and extra-base hits (50), second in total bases (211), tied for third in doubles, fifth in runs scored and sixth in home runs. He was named the 2012 American Association Player of the Year, selected to the American Association All-Star Team and was honored as the Pointstreak American Association Player of the Week for July 23-29. The 6-3, 200-pounder is a 13-year veteran of professional baseball and former third round draft pick (76th pick overall) of the Chicago Cubs in the 2000 Amateur Draft out of the University of Richmond (VA). In 1011 career games, Jackson has batted .293 with 245 doubles, 39 triples, 120 home runs, 654 RBI and 651 runs scored. He spent parts of two seasons at Triple-A and three years at Double-A.